NATURAL HABITAT AND PREFERRED SITE: Yaupon holly grows in the moist acid woods of the Pinelands, also on the prairies throughout Southeastern Texas. It is a well-adapted tree to a variety of soils from sand to clays, can take fairly moist soil but is, on the other hand, quite drought tolerant as well. Common in low woods and thickets along streams. 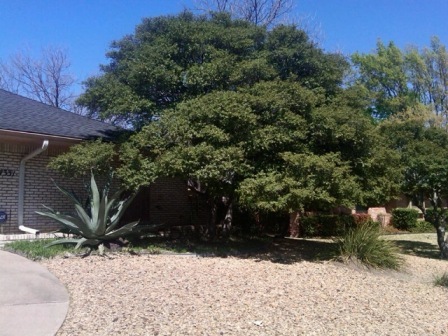 It is the most abundant native holly in Texas although it is kin, the possumhaw, (Ilex decidua) has a wider range. Both can grow in sun or shade. IDENTIFICATION INFORMATION: Bushy form unless trimmed into a tree shape. 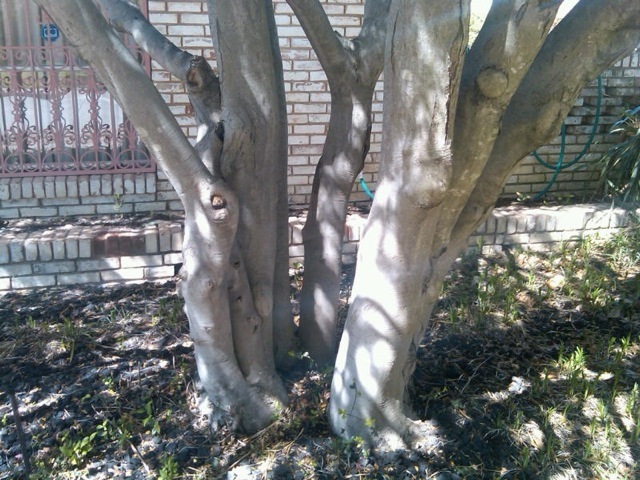 It has light color bark and interesting branching with small evergreen leaves without spines. Female plants have red berries in the winter. FLOWERS AND FRUIT: Flowers are small, white to greenish-white in the spring and attract honeybees as pollinators. Fruit is actually a round droop berry. Each fruit contains 4 to 8 seed. Fruit is eaten by many birds and other wildlife. FOLIAGE: Small round, spineless, evergreen leaves. They are simple, alternate, thick, smooth or mildly toothed. CULTURE: Yaupon holly is easy to grow in most any soils and is fairly drought tolerant although can stand quite moist soil as well. It grows faster when under irrigation and regular fertilizer applications. PROBLEMS: Leafminers occasionally but nothing very serious. PROPAGATION: Yaupon hollies can be grown from seed or stem cuttings. INSIGHT: The biggest problem I’ve ever seen with Yaupons relates to the plant being dug from the wild from large mottes or masses. When these trees are cut out of these masses, each individual tree has little root system and the transplant shock death rate is extremely high. It is best to buy container grown or at least nursery grown yaupons for best results. If you buy transplanted yaupons, be sure to choose those that have been in the nursery for some period of time and have hardened off.